Since the beginning of time, humans have been leaving marks on the land. From rock art carved by ancient peoples to interstate billboards advertising cheap gas. We humans have been leaving our mark at different time periods and for a variety of reasons. My project entitled, “Remembering” is inspired by the billboards I saw as a child growing up in the Southwest where billboards were a familiar site. The large advertisements were often strung together -sometimes only 20 feet apart- ad were stretched along the interstate for miles. From a 10-cent cup of coffee to Handmade Indian crafts, the images and colorful lettering on the billboards were big and bright enough to see from a distance. The messaging of selling gas and coffee alongside culture both intrigued and confused me. I never understood what a 10 foot high, illustrated caricature of an Indian woman making pottery and, kinda resembling my Aunt Carma, had in common with the price of gas. I was unable to make sense of how someone, not from the same culture, saw and commodified the culture I was from. This conflicted with my true identity, an identity that came and still comes from my community, culture and the land we walk. As an adult, I can clearly see the same kind of advertising on certain sections of I-40. These new billboards reminded of the insidious marginalization of culture that still comes from advertising— then and now. So “Remembering” is a response to the billboards that cluttered my youth with confusion. 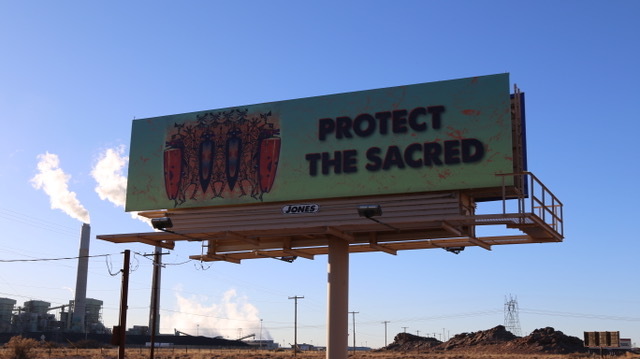 The “Remembering” billboard stands unapologetically in front of the Cholla Power Plant on I-40, twenty-three miles East of Winslow, Arizona. Cholla Power Plant processes coal and basically employees a large segment of Joseph City, a small town a couple of miles away. I-40 is the main artery to most of the West Coast cities so there’s an endless stream of traffic day and night. The Cholla plant exists on traditional tribal lands so many travelers through I-40 are indigenous. The message of the billboard is accompanied by an image native people will recognize as cultural in nature. This message is for them as well. “Remembering” acknowledges and reaffirms the values crucial to our survival as indigenous people - Land. Culture. Community. Family. “Remembering” is not advertising in the “normal” sense of the word. However, it is promoting a non-tangible concept. It’s the concept of protecting the sacred-ness of life no matter who we are, where we're from or, where we're going. The “Remembering” billboard stands unapologetically in front of the Cholla Power Plant on I-40, twenty-three miles East of Winslow, Arizona. This is the mark “Remembering” is making.